The late Professor Elie Wiesel, on April 22, 2013. Photo: Sarah Rogers / Algemeiner. The son of Nobel laureate Elie Wiesel has responded to the antisemitic desecration of his father’s childhood home in northwestern Romania over the weekend. In addition to condemning the attack, Elisha – who serves as chief information officer at Goldman Sachs – offered some practical steps and called on the Romanian government to add his father’s most famous work, his memoir “Night” – about his experiences in the Nazi death camp Auschwitz – as mandatory reading in the country’s national curriculum. “What she is doing deserves far more attention than the scrawled hatred of some drunk thugs. What can be done to help her?” he concluded. In total, 380,000–400,000 Jews were murdered in Romanian-controlled areas during the Holocaust under Marshal Ion Antonescu, the country’s fascist dictator who was allied with Nazi Germany. 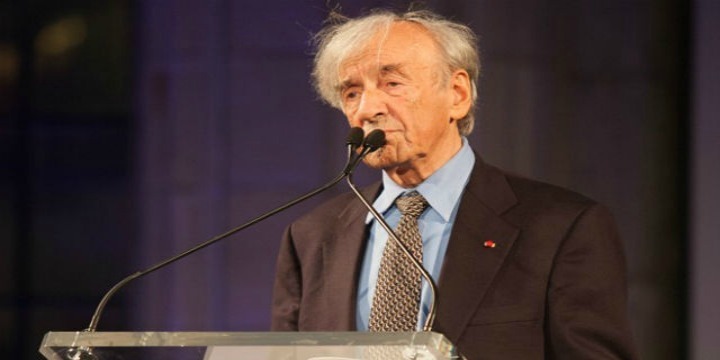 Elie Wiesel and his family were deported in 1944 to Auschwitz. While he and two of his sisters survived, his father, mother and younger sister were murdered there. He received the Nobel Peace Prize in 1986.